Statistics Canada released its Mortality, Summary List of Causes 2007 (1.0 MB PDF) today, with a ton of tables on causes of death, by provinces, territories and country, gender, age, etc. As morbid as it may sound, I thought it was a rather interesting document to browse through. It’s not because I wanted to know about all the ways that people died, in summary groups, but rather how they compared to each other. We often hear about stats on various diseases, accidents, criminal activities and other causes of death. However, it’s often without context, like how does it really compare to other causes since lots of people die every day, or the context whoever is trying to persuade you of something wants you to hear. In other words, death stats are often presented to you in propaganda format. Lobbying format if you want to be kinder. What the tables in the Mortality Summary List does is let you go through those numbers yourself, though they would generally be of more interest to Canadians since it is about Canadians. See the big and the small numbers of deaths and their causes. Which ones topped the list? Find the causes you’re interested in and see how the number who died compared to other causes. How does cancer compare to car accidents? Is AIDS that prevalent any more? See how it is in your province or territory. Are the top causes the same? Maybe even make comparisons, though you’ll have to do a per capita (per person) or percentage type of calculation to have a fair comparison in some cases. The Mortality Summary List even provided some of those calculations for you! You’ll never had such a clear idea of what Canadians died of in your life! Were things the way you thought they were? You may want to rethink some things about various issues related to death, whether disease, crime or otherwise, especially where priorities should be put. It is too bad this data is relatively old, being for the year 2007 when we are almost nearing the end of 2010. StatCan is generally pretty good at being far more up to date than that. Odd, though, that they have economic data for so many things up to the month when what’s called vital statistics such as this lags almost 3 years behind. However, unless there were some shocking new trend, and I mean shocking by numbers, not by gruesome image or high profile media stories like shark attacks, things won’t have changed much. You’re still getting a pretty good idea of what’s happening. That said, in 2007, deaths by major cardiovascular (heart) disease passed deaths by cancer for the first time in 10 years, though the trend had been predictable from previous years. Together, heart disease and cancer combined for a staggering 59% of all Canadian deaths in 2007. Can you see the impact of obesity on society coming? Who wants to bet this order remains the same for most of the next 10, maybe even 20 years? Anyway, it isn’t morbid to mull over stuff like this. Death is a part of life. While this is not a spiritual examination like my philosophy in the previous sentence often suggests, it is a social understanding of it for Canadian society. And whatever tangents your mind goes on thinking about death, it certainly is a lot to think about! Seriously, it’s not a morbid exercise. Quite enlightening, in fact. I hope you give it a look. I’d should do some research to find an American equivalent to have a look. I bet that’d be real interesting, too! CANADA Monumentous in Routing Russia 7-3 in Winter Olympics Quarter-finals! The ice used to be the home turf for the Russians in the Winter Olympics. For many years, they dominated in figure skating and hockey. Yet, this year, they got kicked off their own turf. For the first time ever, they didn’t win a figure skating gold. Now, they won’t even win a hockey medal. Stunning! I wonder how Russia is going to handle that! In what should have been the Olympics hockey tournament final, Canada faced off against the Russians in the quarter-finals and put on a monumental performance to beat them 7-3. Canada was out to a 3-0 lead before 13 minutes was over, hitting all over and putting huge pressure on the Russian net. The rest was an exciting victory and scoring fest, well, for half the game anyway. The scoring got shut down in the second half of the game, but that was only after 10 goals had been score in the first 32 minutes. When everything was on the line, national pride came through to beat the Russians emphatically! Canada now await the winner of the Sweden/Slovakia game later tonight for the semi-finals on Friday. The United States beat a game Swiss team 2-0 earlier today to await either the Finns or Czech in the semi-final Friday. Given how the Canadians have played this tournament, and the awesome line-up of the Russians, I don’t think many thought it was going to be lop-sided, if the Canadians were going to win at all (unless it was out of pride). After losing to the United States on Super Sunday in the round robin, victims of an unearthly performance by US goalie, Ryan Miller, Canada had to play Germany on Tuesday in a qualifying game to get a chance in the quarter-finals against the Russians Wednesday. While the Germans were not expected to be a challenge, it was effort for Canada while the Russians rested. However, the game gave Canada a few much needed tune-ups for this game that they put to good use. Canada got a chance to work on their grinding game, which they applied well to pound the Russians with many a hard body checks tonight right from the get go. Canada got a chance to pocket a few goals and get their scoring touch back. Canada came out hitting with a crusher by Shea Weber on Ilya Kovalchuk, followed by quick scoring from Ryan Getzlaf just 2:21 into the game. Ryan scored on Russian starting goalie Evgeni Nabokov after a pass by Dan Boyle who had gained the zone. Chris Pronger drew the other assist. That pressure from the start was kept up throughout the game, though, as the Canadians were constantly buzzing around the Russian net, outshooting them 21-12 in the first period and 42-28 overall. The 21 shots were the most by a Canadian team in a period in the Olympics. The first penalty came to Canada, on a figure skating worthy spinning dive by Captain Alexei Morozov after being touched by Brent Seabrook. It called by American referee Denis Leroux from way out in the neutral zone. The Canadians killed it off easily enough, with a bonus cruncher on Alexander Ovechkin by Drew Doughty, to avoid losing momentum. However, when Russia’s Anton Volchenkov got a holding penalty next, Dan Boyle scored on the power play at 12:09 on a beautiful passing play from San Jose Sharks teammates Danny Heatley and Patrick Marleau. Just 46 seconds later, at 12:55, the Russians turned the puck over as Canada came out on a two on one rush. Fed by Mike Richards, Jonathan Toews had the puck and fed Rick Nash, who put it past Nabokov. The crowd, already in a frenzy, went absolutely crazy, prompting Russian coach Vyacheslav Bykov to call a time out. Smart move, because not long after came the first Russian goal. Dmitri Kalinin scored the first Russian goal by a defencemen of the tournament on a screened shot from Anton Volchenkov. Kalinin shot it past Canadian goalie Robert Luongo’s high glove side at 14:39. Sergei Federov got the other assist. Canada never lost the momentum, though, as they got back at putting pressure on the Russians right away. It didn’t even take four minutes to pay off as Brendan Morrow walked out from behind the Russian net to jam a back hand through Nabokov at 18:18. Russian centre Sergei Zinovyev, who has a bad knee slightly exaggerated a few days back to be potentially 6 months to heal, had not being able to keep up with Morrow on the play. Dan Boyle got his third point of the period to assist on the goal, while Duncan Keith also got an assist. The Russians did not choose to replace Evgeni Nabokov to start the second period despite his four goals allowed on 21 shots in the first period. That was the fatal error to blow the game for the Russians as Canada quickly potted a few more goals on him early in the second period. Cory Perry scored on Canada’s first shot in the second period at 3:10. Ryan Getzlaf’s shot deflected to him and he caught Nabokov still reacting to the deflected shot. Duncan Keith also assisted on his second consecutive goal. Less than a minute later, at 4:07, Shea Weber blasted one past Nabokov from the above the right face-off circle. It was assisted by Jonathan Teows and Jarome Iginla. That chased Nabokov for back-up Ilya Bryzgalov, who didn’t end up faring much better. However, the goalie change gave the Russians an immediate spark. On a couple of passes from Ilya Kovalchuk and Denis Grebeshkov, Maxim Afinogenov burst past Duncan Keith just half a minute later, and scored on Luongo at 4:46. As before, Canada picked up the intensity immediately, refusing to let the Russian gather any momentum. After five minutes of intense play, Russian centre Zinovyev made a terrible turn over at centre ice. Eric Staal capitalized it to feed Ryan Getzlaf, who then fed Corey Perry to blast a zinger on Bryzgalov at 9:51. A too many men on the ice penalty at 11:27 gave the Russians an opportunity to stop the flood, and that they promptly did. Sergei Gonchar, on a pass from Evgeni Malkin, put a shot past a screened Luongo at 11:40. However, they could not get anything more. Despite the four goal lead, a critical hooking penalty by Duncan Keith ended a period on a somewhat uncomfortable note for the Canadians. Four goals isn’t necessarily a safe lead given the star fire power on that Russian line-up. However, the Russians were not able to get anything. Shots were 10-8 for Canada, leaving it 30-20 after two periods. The Russians started the third period on the power play, but nothing became of it except a little frustration. Not long after the penalty expired, Volchenko knocked Eric Staal hard into the boards as Eric went to get the puck behind the Canadian goal line. Staal was not touching the puck at the time, but neither interference nor boarding was called. Staal was down for several minutes, but was able to get off the ice on his own. Sticking up for Canadian pride, Canadian style, Ryan Getzlaf didn’t take long to lay out Volchenkov on a clean hit just minutes later. Russia then got a too many men on the ice penalty, but Canada was not able to capitalize on it. The pressure Canada put on the Russians up to this point was still present to a reasonable amount, but things got relatively quiet after this. Well, anything is relatively quiet after 10 goals in the first 32 minutes! To credit, the Russians did play through the third period, but Roberto Luongo stepped up as well. So despite the effort, Russia did worse on the scoreboard in the third period than the others. Shots were 12-8 for Canada in the third, leaving the final 42-28 for Canada. Drew Doughty shadowed Alexander Ovechkin all night, and shut him down just he like on Jan 2 when he played Ovechkin in the NHL. They each played 26:47 that night, where Drew was a +1 and Ovechkin was a -1 without points. Drew made Alexander the Great into Alexander the Late, cause OV never arrived in the game. His only statistical contribution was serving a 2 minute penalty for too many men on the ice at 5:11 of the third period… and a -2 in the game. OV did get hit in the hand oddly by a wrist shot in the 12th minute of the third period, though, but that only limited him for 7 of the 60 minutes. To be fair, Sidney Crosby was also “absent”. But you know, Sid wouldn’t care, being the team guy that he is. Get your free North Carolina showboatin’ coupons here to give to non-UNC believers, especially Duke ones! 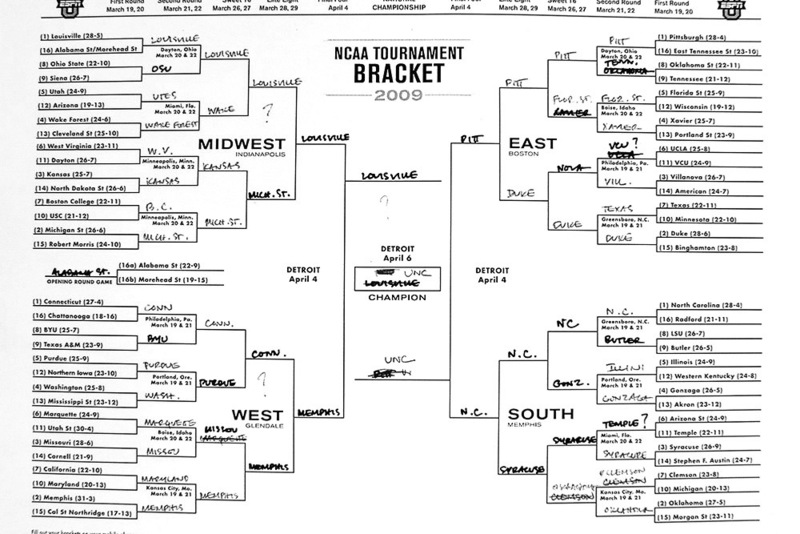 If President Obama’s economic stimulus plan turns out as well as his 2009 NCAA March Madness Brackets, aka the Barackets, then Americans and the rest of the world doesn’t have a lot to worry about. He did relatively well overall, as shown from the scoring system analysis below. Such a score would have placed him in about the top 10% from what I have seen in some large polls like the one on Facebook and CBS Sports. But more importantly, especially, he correctly picked the University of North Carolina to win it all after the Tar Heels dismantled the Michigan Spartans 89-72. Here’s a recap and final analysis of the President’s performance and journey through the bracket developments this year. On March 19, President Barack Obama shared his bracket picks, as well as reasoning, worldwide in an ESPN video. Now, for any of you not familiar with ill-advised actions for a politician, picking winners and losers is something politicians do not like to do! That’s because they lose votes any time they have to pick winners cause someone loses. For someone like a President of the United States to be playing favourites, especially with the risk of getting things very wrong as is very easy to do in March Madness, was a huge public relations risk. However, all that did was showed the President’s confidence and as the final result showed tonight, with UNC winning as picked by the Prez, that confidence was not false… even if he generally had a pretty safe set of picks. But that’s a risk on its own as they don’t call it March Madness for nothing, you know! That, America, you should take note as you look to him for more leadership in uncertain times upcoming. The road the President took to get here started out great. He had 14 of 16 teams correctly picked for the Sweet Sixteen Round and was doing great on any of the popular scoring systems used to track NCAA brackets. Unfortunately, the middle of the road was bumpy, leaving the President with only North Carolina among the Final Four teams. That might well be a sign Americans need to heed as they go through this economic downturn and recovery. Some things might go wrong, not turn out well, seem like a bad choice. However, the big and most important one will be on track and you should hang on hope for that. That’s because North Carolina ended up winning it all, which, as typical of the American winner-take-all mentality, should be all that matters to you. And not only did they win it all, they won it convincingly. If the President’s performance was an indicator of how he will get through this economic downturn, or maybe for his term, he’s going to do quite all right! So way to go, Mr President! You’ve got a great reason to smile! And congratulations to the University of North Carolina Tar Heels, especially Tyler Hansbrough on a fairy tale college career! Finally, here, for you nerds keeping score, is the final tally from the scoring systems in which I have used to analyze the President’s performance throughout the past few weeks. If you are in a betting pool with your NCAA brackets, chances are you are using this scoring system. This system rewards 1 point for a win in the first round, 2 in the second, 4 in the third, 8 in the fourth, 16 in the fifth and 32 to the ultimate winner. Upsets gives nothing extra. The maximum points is 192. In this system, President Barack Obama has 122 points after four rounds. But don’t forget, it’s not like very many scored 192 or that much higher. Anybody not picking North Carolina would have lost 32 points and sat at 160 automatically, never mind any other potential losses! Some pools reward upsets in a minimal sort of way with one point for each upset. It’s not much but it could make the difference between similar results of correct games picked. In this system, President Barack Obama has 124 points. There weren’t that many upsets this year relative to other years so the overall total was not much higher than 192. But because the President had a relatively safe set of picks, he didn’t not have many upsets on which to capitalize, and he did pick a few of them correctly. This system is used by the Canadian channel The Score in its pool, which I am in, though I didn’t read the D rule because I would have picked very differently for some underdog teams. In this system, President Barack Obama has 124 points . It wouldn’t be fair to put this one on the President because it has a very different strategy I described in the original scoring system post. Picking safe is not the way to go to do super well in this tournament. That said, 124 points is a pretty respectable score. I know. I did only a little better and placed quite respectably. This European style scoring system values the overall judgment and minimize fluke results of someone selecting the correct ultimate winner despite performing not so great otherwise. The maximum points for the first four rounds is 60, out of 63 eventually. In this system, President Barack Obama has 40 points after four rounds. Forty points is quite respectable among all the brackets. SO HOW DID YOU DO COMPARED TO DA PREZ?